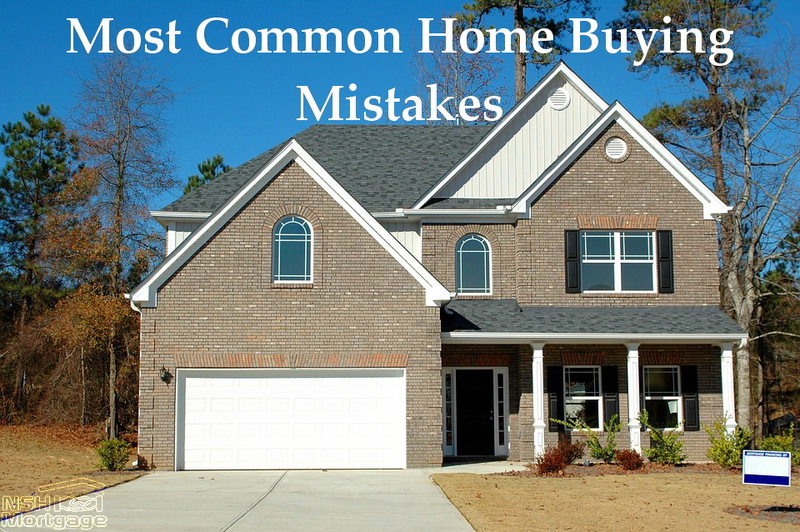 Most Common Home Buying Mistakes and Knowing What You Should Not Do. NSH Mortgage has the wisdom and tools to help you make the best financial decisions. Owning a home is one of the most effective wealth building tools available to the everyday consumer. It is no wonder that first-time home buyers are out in force. Today one in three house sales belong to first timers and many more are queuing up to become homeowners in 2017. But when you have never done something before, it is difficult to know what you should not do. Sometimes, new buyers can make mistakes. Fortunately, the mistakes even if made do not mean disaster, but if you can avoid them you should try to make an effort to do so. Here are five common mistakes that several first-time buyers and experienced ones usually make when trying to buy a home. Do not go shopping for property before getting pre-approved for your mortgage. Mortgage pre-approval offers so many advantages. It’s fast, and can save you headache down the road. Sellers and agents will not take your offer seriously without a pre-approval letter. Pre-approval helps you determine what you can afford. Pre-approval minimizes financing problems during escrow. Note, that mortgage pre-qualification does not usually go far enough. Until you finalize an application package and receive a pre-approval from a mortgage underwriter, you are still not fully prepared to close on a home purchase. This could result in embarrassment, wasted time, and lost money. Expensive hobbies may leave you less money for bills. A planned job or industry change could cause your income to decrease. Starting a family, retiring or sending kids off to college may strain your budget. Too much of a mortgage could reduce what you can save or contribute to charity. An expensive commute can unbalance your checkbook. Starting a new business could eat up your savings. Keep in mind also that housing expense is about more than the mortgage, taxes and insurance. You will have maintenance and repairs, and this will run between one to five percent of your current home’s value each year, depending on your home’s condition and location. If there is any doubt, do not push the envelope. When determining an affordable payment, consider what you are spending on housing now, and decide how much more you can afford to pay. Get a home inspection and an appraisal, even if your lender does not require it. Make sure the property’s septic system (if not on city sewer) has been pumped and inspected in the last five years. Include a financing contingency in your contract which negates the contract if financing falls through. Make the purchase contingent on the sale of your current home, if applicable. Only put up refundable earnest money. Read your community’s Covenants, Conditions and Restrictions (CC&Rs) for deal breaker rules. In addition, order the home’s Comprehensive Loss Underwriting Exchange (CLUE) Home Seller’s Disclosure Report. It lists insurance losses at the property address within the past five years and can alert you to potential problems with the home. Choose your real estate agent based on ability, reputation and experience not because she is your Mom’s friend or he is married to your cousin. Even if you have a good agent, though, do not let him or her pick your mortgage lender. Agents care about closing swiftly, which is usually important, but the costs involved may not be on their radar. If you care about costs and mortgage rates, get some quotes from competing lenders, interview a couple of loan officers and choose your own financing. Finally, do not spend every cent you have on your down payment and closing costs. Homeowners should have an emergency savings. If you experience an income interruption or unexpected expense, you need funds in the bank to cover at least two months of mortgage payments. Those who are self-employed, on commission or in troubled industries probably require or need to obtain a six month cushion. Buying a house can be exciting and fun, if you are able to avoid the above listed mistakes then you are doing things properly.